Best known for starring alongside Jack Whitehall as Stephen in the BBC comedy, Bad Education and for the role of Kylie in the BBC’s Beautiful People, Layton will take over the role of Jamie New from 28 January 2019. Layton is no stranger to musical theatre. Having played the title role in Billy Elliot the Musical at the Victoria Palace Theatre, he recently toured with Matthew Bourne’s stunning production of The Car Man. Since then, Layton has performed to rave reviews as the role of Angel in the UK tour of the much-loved musical Rent, followed by a tour of the popular musical Hairspray in the role of Seaweed. If you’d like to see Layton before he arrives in London, he will be appearing in Kiss Me, Kate at Sheffield Crucible Theatre this December. 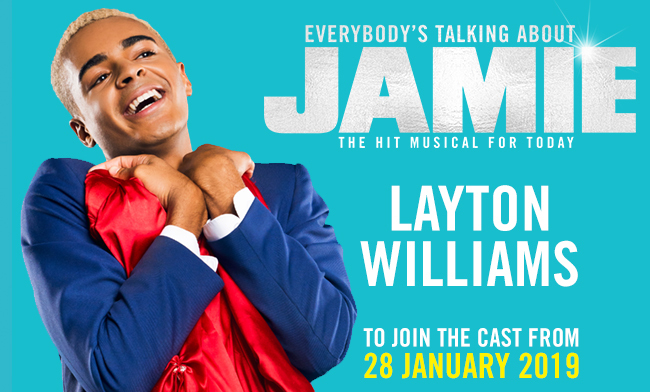 Layton’s first performance will be Monday 28 January at 7.30pm.